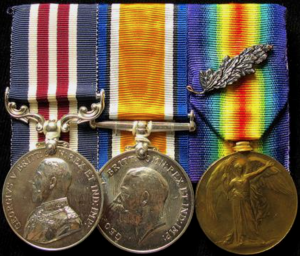 During World War One, British and Empire soldiers could be officially commended for an act of gallantry or meritorious service without the award of a medal, this was called Mentioned in Despatches (MiD). 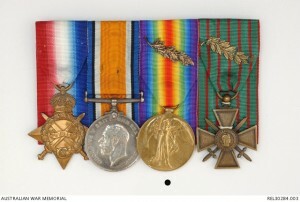 Those recognised in such a manner were specifically named in the official military despatch written by the Commander-in-Chief, initially John French and from 1915 Douglas Haig, which was subsequently published in The London Gazette. 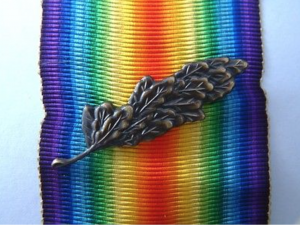 In 1919, it was decided that those mentioned in despatches would be awarded an official certificate, which was retroactive to 1914, and would also be entitle to wear a bronze spray of oak leaves on the ribbon of their Allied Victory Medal. 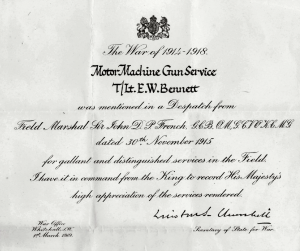 The certificate contained the individual’s service details and referenced the specific despatch in which they were named. 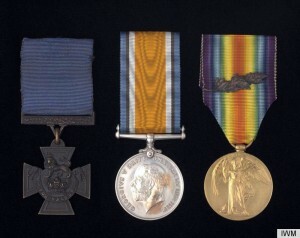 Although sometimes maligned as a ‘failed’ effort to earn a gallantry medal, MiD was almost unique as it was one of only two military awards, alongside the Victoria Cross, that could be issued posthumously. Unlike other awards, however, those recognised were not entitled to use any post-nominal letters but could be commended in such a manner on multiple occasions.